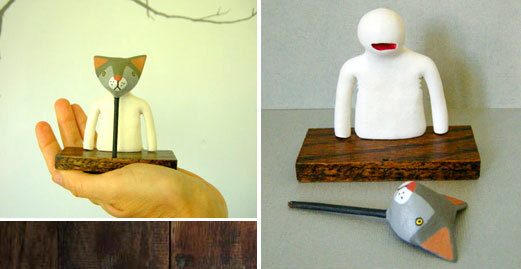 As soon as I saw these clay creatures on Etsy, I knew I had to blog about them. 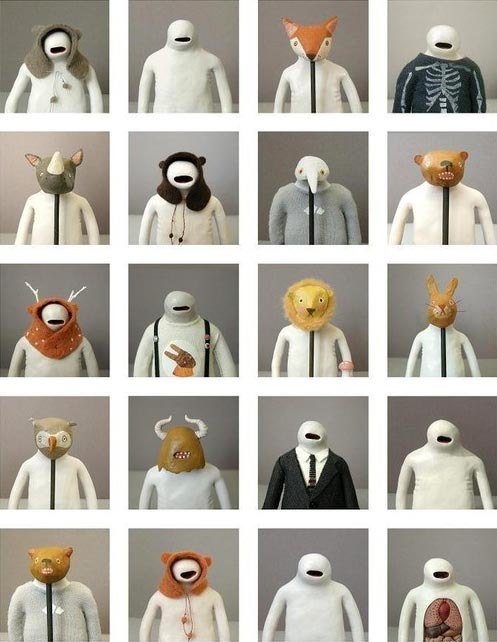 Kim Laurenti of southwest Florida creates these lovable characters she calls Mooks. Kim once had a cat named Mookey and liked the sound of the word. It's true, it just seems to fit. They start as a blank slate with a mouth- then she adds accessories, perhaps a sweater or a hat, maybe some internal organs and then, if inspired to do so, a mask. The Buffalo is one of my favorites. I love his tuft of hair and strong presence. Yet he seems like a nice, reasonable buffalo one could get to know better. 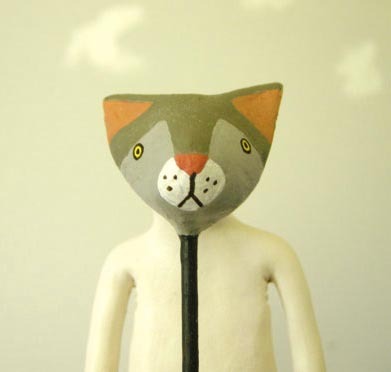 This one is called Mook with a Kitty Mask. All the mooks fit in your hand at just 3 1/4 inches wide and 4 inches tall. To create the masks, Kim makes three separate layers of hand formed paper mache. Then she adds paint and personality. This is Wolfy Mook and as Kim explains, "I think he's pretty cute with his fangs and soft gray ears. It's the epitome of my style, a lot of cute and a little scary." It's always fun to take a peek into an artist's workspace. What inspires Kim these days are books by Haruki Murakami and Richard Scarry. And currently, she listens to the band, The Knife while crafting her creatures. I love the unique perspective Kim brings to the world each day. Thanks for sharing Kim...See the whole mook family here.